A signature in an e-mail is kind of like a footer on a web page. It is generally used to convey contact information, legal notices and other repetitive information. This is something that you may not want to re-type every time you send an e-mail message. Thunderbird allows you to create as many signatures as you wish. You can assign a different signature to each individual e-mail address. Next, I saved the text file in a folder I set up specifically to store signatures. You can save these files anywhere on your PC, but it makes sense to store them somewhere where they will not get separated from the rest of your Thunderbird files. In a previous tutorial, I changed the file location for the Thunderbird files in order to make it easier to back up these files. 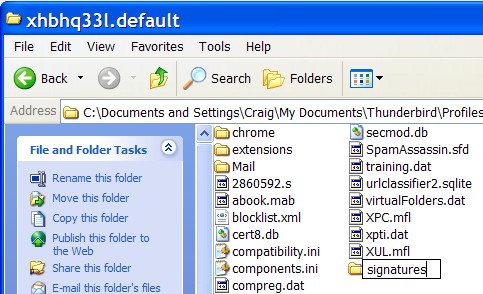 I simply created a new folder called “signatures” in the folder with the rest of the Thunderbird files. Like I said, you can store them anywhere, but when you do it this easy, the signatures stay with your Thunderbird files if you need to move them to another PC or if you have to restore a PC from your backup files. Wherever you decide to store the files, keep them together and name each in a way that makes it easy for you to identify them. Next, you will need to assign a signature to each e-mail address. From the Tools menu, select Account Settings… Highlight an e-mail address on the left-hand column. On the right, check the box that says “Attach this signature:” and then click the Choose button to navigate to your signatures folder. Select the file that you want to attach. Click the OK button to save your settings. You will need to repeat this process for each e-mail address where you wish to add a signature. When you create an e-mail message, you will see the signature near the bottom of the message in gray. Unfortunately, the double-dash just before the signature cannot be removed. It is part of the international Internet standard for e-mail signatures and is automatically inserted by Thunderbird. If you add a URL to the signature file, most e-mail clients will turn it into a hyperlink. But if you need to spruce it up of if you wish to use HTML in a signature instead of plain text, here is what you need to do. Create a text file in the same manner as described above. When you save the file, save it with a .html extension, rather than a .txt extension. Thunderbird will then recognize it as an HTML file. You can then use colored fonts, hyperlinks or just about any type of CSS, as long as you use inline CSS styles. When you are using CSS in e-mail messages, make sure that you fully specify the URLs to images and store the images on your server. Don’t try to embed images or send them with the message. It won’t work well with many browsers. One more thing that has to be mentioned about HTML in signatures is that the message must be sent in HTML mode for the HTML and CSS to work. When you send any message that contains HTML, Thunderbird will ask you if you want to send it in in Plain Text. You do have to click on the Send in HTML Only or Send in Plain Text and HTML for the HTML and CSS to render properly. I’ve been using Thunderbird signatures for a while now, and I’ve noticed that each time I reply to an email, an additional signature gets added. Is there a setting that would prevent multiple signatures from being displayed? I’ve noticed that this doesn’t always happen with other users of Thunderbird that have emailed me. Hmmm. That’s an interesting problem that I will need to investigate. I have a similar issue that I want to try to fix. It may actually be the same as your issue. When you reply to a message Thunderbird places the signature at the end of the sender’s message, rather than just below your response. I would prefer that the signature be placed just after my response. Hmm. It looks like Jason’s recommendation is the correct way to do this, but I see the same problem as berazumis. The “below my reply (avove the quote)” option is not being saved. I think we have found a bug. 1. Go to: Tools, Options, click on Advanced tab, then the General tab. 2. Click on the Config Editor button. 3. In the Filter box, enter the word “bottom”. 4. Look for mail.identity.default.sig_bottom. If it is set to true, double click on the entry and it will switch to false. 5. Here is the additional step. Look for any other entries that end with “sig_bottom”. My setup included one that said, “mail.identity.id7.sig_bottom. If any of those are set to true, double click on the entry to set it to false. 6. Close the about:config window and click OK on the Options window. It looks like mail.identity.default.sig_bottom is indeed a default for signatures, but if you have already configured a signature, there may be an overriding entry. In my case, it was id7, which represents the e-mail address for which I set up a signature. A big Thanks for all of you – for posting this problem & coming up with the answer. Steps which TE said worked superbly for me. Hi we keep signatures on a central server and have each users Thunderbird point there (makes updating easier to manage), however this only works when people are in the office. I wondered is it possible to have thunderbird point to signatures stored on a web server so that people could still use them out the office. It looks like Thunderbird only allows you to select a local/network signature file, but there may be a workaround solution. Does anyone know the answer to this one? I’m trying to add a web link instead of a local file, but TB will not accept it. Is this what TE refers to above, and if so, anyone yet have a workaround? Thanks. When I first started using Thunderbird, there was a box on the bottom right of the window with the word signatures displayed there. I created (can’t remember how) 5 different signatures to go with different ‘hats’ and was able to select a signature at will to add to any message. I recently went through som processes to add encryption to one of the email boxes and in the process lost this choose a signature functionality. I can’t seem to find any information on how to get it back. Any help would be appreciated. Hmmm. You should be able to select a signature file anywhere on your PC from the Account Settings page. Right click on an account and select properties. There is a search box that allows you to browse your PC and select a signature file. It is possible that you had an Add-On installed. There is an Add-On called Signature Switch that allows you to set up multiple signatures that you can select. You can find it at https://addons.mozilla.org/en-US/thunderbird/addon/611. I have not used it but I understand it is very popular. You might want to try it to see if it resolves your issue. When I set my Thunderbird to place my signature above the quote and below my reply it removed the double dashes. That is one way of removing them. Note that the fix above for getting the sig to appear at the end of a reply (and before the quote) does not apply to forwards. If you forward an email, your sig appears down below everything without any apparent config to change that. Maybe Mozilla will get to work on that one for the next revision? This whole cut and paste thing for sig’s defeats the purpose of having the sig in the first place! Thanks to everyone on the “signature above the quote” bug and fix! That was driving me insane – I would select “signature above the quote” for the particular identity, but it wouldn’t save! Thankfully TE’s extra-digging fix worked for me too. Too bad it’s still a problem for forwarding… Oh well… Thanks again! You know this “signature above the quote” option is in the regular Account Settings, right? There’s no need to go digging into Manage Identities or changing the config. When following the above instructions I too got the failed-to-save problem, but if you do it this way it works and saves correctly (version 2.0.0.12 (20080213)). Select “Composition & Addressing” in the left-hand panel. Where it says “and place my signature”, select “below my reply (above the quote)”. At first I didn’t think it would work in my version of Thunderbird 2.0.0.14 (20080421). The “and place my signature” select box is grayed-out an disabled. But if you change the first selection just below “Automatically quote the original message when replying” from “start my reply below the quote” to “start my reply above the quote”, the following selection changes to enabled and “place my signature below my reply (above the quote)” can be selected. For some reason the change does not work on all e-mail accounts, but it does work on some. I originally tried this, but it didn’t work, probably because I tried the change on an account that would not allow it. Now that I’ve tried it again, I find that it does work on some accounts. Strange. I do not immediately see any reason as to why it would work for some, but not others. I’ll have to dig into it. (sigh). I’m one of the lucky ones. Doesn’t work for me. I’m on the latest beta. It was driving me nuts having my sig at the bottom and doing cut/paste so many times. The trick suggested by TE worked great for me…A zillion thanks!!! However, I would love to know the work around to solve the same problem with Forward.. If someone finds it, please let me know.. If you want to add colors, try adding some CSS to the signature file. Should produce text in red. Just look up the hexadecimal RGB number for the color you want to product and replace the f00 in the span tags. I have tried changing the config settings but it didn’t work for me. I also tried Forwardcharm’s suggestion but despite TE’s advice that option still remains grayed. Anyone else any ideas? I’m also struggling to find how to select a signature as a default. I have one selected which I no longer use. Cannot seem to find how to make the chage. I can set where I want my signature (above the quote), but as soon as I hit OK, it forgets. Thanks to everyone I have finally created a signature! The only way I could do it was to create it in notepad. Anything else was encrypted when I used it! Now can anyone tell me how to use color and two different fonts? Even in notepad it ignored the font I chose! And there is no color option. There is a good reason for using Notepad. You need to use a pure text editor. Word and other word processor files are loaded with embedded codes. That is why Notepad is mentioned at the beginning of the tutorial. You cannot select fonts or colors in Notepad because that would embed codes. You need to manually create the codes using cascading style sheets (CSS). The CSS technique using span does work for changing fonts and colors in signatures, but you must learn to use CSS. You also need to save the file using the .html extension. It will not work if you save the signature file as a .txt file. Can anyone help with this problem. When I receive an email which contains the sender’s signature, then when I hit reply, the sender’s signature is removed! The quote of their email comes up without the signature part. Are you replying in HTML format? If their signature is an image signature and you reply with a text message, the HTML signature will be removed. No I am replying in normal format, and their signature is definitely pure text. Notepad is the only MS product that I’m aware of that does not inject all kinds of garbage code when you save something as an HTML file. I have created an html signature with a cut and paste image of our company logo in it in html. When I compose a message the logo appears normally, however after I send it and check the message I find that the image is no longer there (but only on some of the emails). The text is fine but the image has the box with the red dot in the upper left corner. How can I fix this? I have not experimented with images in signatures. Make sure that you are sending the message as HTML e-mail; otherwise, the code may get stripped out. There are two ways to include images in HTML e-mail. You can embed the image or provide a full URL. The general rule with e-mail is to put the images on your server and provide a full path to each image. Several e-mail clients strip out embedded images. Thunderbird and many other e-mail clients block the paths to external images (images on your server) to prevent problems with web bugs that are used by spammers to verify that an e-mail address is valid. That is why you have to click the Load Images button to view the images in HTML e-mail. Thunderbird has a page that focuses on signatures. It also covers the proper methods for including images in signatures. When I create new mail, sig is fine. When I reply, the image in my sig isn’t there. When I forward, Sig is at bottom of page. Just what I was looking for! (Brian, your answer is on comment number 3 from Jason – that’s exactly the problem I had) – Thanks Jason! Thanks an absolute ton for putting this together. My brain was melting trying to figure it out, especially coming from using Outlook for so long. I don’t get it. Why would I want to set up a signature file for each E mail address that I have or want to use. You need to re-read the comments. It looks like you are confusing e-mail accounts with address book entries. A signature has nothing to do with the address book. You can just create one signature and attach it to each of your e-mail accounts (not the address book entries), or you can create multiple signatures and use different signatures for different e-mail addresses. We run several companies with multiple web sites and multiple e-mail accounts. Each e-mail account has a separate signature. You only need to attach a signature to an e-mail account one time. I could not find any proof that double-dash just before the signature is a standard for e-mail signature. It is a standard on Usenet (http://tools.ietf.org/html/rfc3676#section-4.3), and tend to be used for e-mails too. Where did you find this information ? The double-dash is officially called a “signature separator.” I read about the signature separator standard on several sites when I tried to find a way to remove it. It is used to separate content from the signature. Thunderbird automatically includes it and there doesn’t appear to be a way to disable it. It is therefore a standard that the Thunderbird developers use. According to this site, the signature separator is used by some e-mail programs to trim off signatures when you reply to a message, so there may be a technical reason for using it. Thunderbird rocks but the sending signature as an attachment blows my mind. There has to be a way to send the sig NOT as an attachment like other email clients. Any suggestions? My sig is HTML and the logo is pointed to public site, not imbeded. Everything is setup and works in imail, outlook and other clients but to say the least I’m switching to TB for other reasons. This drives me nuts as it is email rule #1 not to send sig as an attachment. anyone? anyone? The configuration is screwed up for your signature. Thunderbird does not normally send signatures as attachments. 3. In the Filter box, enter “attach_signature”. 4. Try to determine which entry is for the e-mail signature that is showing as an attachment. If you only have one signature assigned, there will only be one. If it is set to false, double click on the entry and it will switch to true. OK, so we’re stuck with the signature separator … is there any way to change its color in Thunderbird ??? Changing it to match the background color would at least make it less obvious. I have no idea if that is possible. It may be hard-coded into the Thunderbird program code. Doogie … Following some more research, I found the Thunderbird won’t insert its signature separator if the signature contains the “– ” sequence. So I put it at the top of my signature – in white on a white background – and boom !!! It partially worked. Replies no longer have the Thunderbird inserted separator but new message and forwards do. Go figure … got any thoughts on that ??? Interesting. It could be something that is undocumented. It also looks like something that is buried in the object code for Thunderbird. That is beyond my reach. I’ve used and loved TB for ages. I’ve rebuilt my PC so installed the newest version of TB (2.0.0.21), for which the “signature” addon isn’t compatible. I’ve followed all the advice on this (and countless other) page but still when I reply to a message, my signature-defined image is the little “image not found” icon. Creating a new message is fine. Forwarding sticks the signature at the end and also doesn’t display the icon. Has this got worse in v2 or is that coincidence? Can anyone help? It is difficult to tell what your problem is given the limited amount of info you provided. If you are seeing the “image not found” icon, then it is obvious that there is a problem with the path to the image. 1. Are you using the HTML extension on the signature file? A signature file MUST use the .html extension if you include HTML code, including paths to images. 2. Are you using a link to a local image on your PC in your HTML signature file? If so, a message on someone else’s PC will never find it. One solution is to place the image on a web server and use a fully formed URL to the image. This only works if you have a web site. Many ISPs offer freebie web sites. 3. Try using Thunderbird to create your signature file and embed the image. Start with a blank message. Add the text that you want to show in the signature. To embed the image, use the menubar Insert > Image. Select the image to embed. To save the signature file, use the menubar File > Save As > File. Make sure that you save the file with the .html extension wherever you have stored your signature files. When I add the signature in either HTML or RTF it only shows the HTML markup language – not the actual text. The original text is color green. How do I get it to load the signature correclty? You cannot use a txt file extension when using HTML markup in a signature. You must us an html extension and must make sure that Thunderbird is configured to use HTML mode. Read the last section of the tutorial shown above. I have the ‘_ _’ and am fine with it, however under it are the characters ‘PK’ which I would like to remove. Any suggestions anyone on editing away these things? Thunderbird is not inserting these characters. They are in your signature file. Do not use a word processor to create the file. You must use a pure text editor, such as Notepad. I do not have notepad to save my signiture to. Can you advise any other way to add signiture or do you possibly know how to get notepad? Is this a free program? Notepad is free and comes with every version of Windows. It is in the Accessories section of your program menu. You could use Word, but you have to make sure that you save the file as a text file. If you do not save the signature as a text file, the file will have embedded characters, which can do strange things. If you do not use Windows, check your operating system. Every operating system comes with at least one pure text editor. I’m looking for ways to highlight my html signature with either a box around my signature or just change the background of my signature (not the whole e-mail) to off-white. I’ve had some success with the box approach but sometimes the box shows up shifted with respect to the signature. I prefer to just change the background color of my signature to off-white but I can’t figure out how to do it. You might not be able to change the background for the entire signature, but you should be able to create a box around the signature and change the background for the box. Make sure that you save the signature file using the .html extension. CSS will not work unless it is an HTML file. 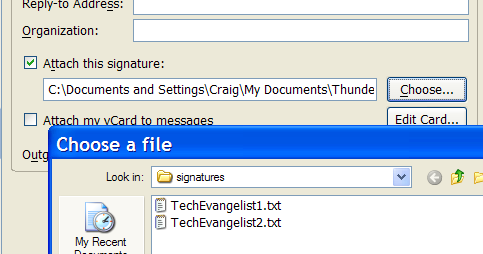 For what it’s worth I found a solution for people who don’t like the “– ” that Thunderbird inserts before signatures. 2. Open thunderbird.exe in a text editor (smart to make a backup first) and search for ‘moz-signature’ (without the quotes). 3. The first instance found will be in the string ”. The two dashes are just to the left of that string. You need a proper HEX editor to do this. Secondly, is there a way to add a specify the font of the signature without using html? Thirdly, if html is used and a the recipent doesn’t recognise html – what will they see? Will they see the tags, or just the text. There is no way to style a font in the signature without using HTML or CSS. Most e-mail clients act like a browser and there isn’t any way to style a font on a web page without using HTML or CSS. The answer to the third question depends upon the e-mail client. Some people do set up their e-mail client as “text only”. If you are not certain, send the message as text. Having trouble with CSS in my signature. I have the body text set to a dark blue (I’ve also tried other colors) and it continues to come in gray. I have another signature I’ve been using for a few years that works fine. Anyone else have this issue? figured it out. I guess assigning CSS to the body tag is the problem. I assigned the colors to the individual classes instead and it’s fine. I too had some difficulties with the signature and image in this. First of all, i found ound this method works great: Writing signature text as a new mail, setting the colours and size that you wants, insert an image (if you want to), and then SAVE AS A HTML file. Afterwords, set TB to use this file as signature. This works great, but then the problem occured with redirecting an replying to messages. The image in my signature just wouldn’t attach. So i placed a copy of the image (that used to be on the server station at my workplace), on a local folder at my computer. Thanks so much TE I now have a signature in colour and using a dif font…….only problem is, it is all on the same line!!!!!!!! You need to add an HTML break tag to the end of each line in your signature. That is the same as a carriage return in HTML. It will create a new line. Without a break all of your signature text will be on one line.